With well angled frontal armor, layers of spaced side armor, and a rock solid turret, a properly angled T14 can withstand hits from all but the biggest guns available at tier V. Though though it can take a great deal of abuse, the poorly armed T14 isn't very good at returning the favor. Capable of bullying smaller opponents and outmaneuvering larger ones, the T14 is equal parts heavy and medium tank. Though the T14 may have a number features more typical of medium tanks, its armor is not one of them. The T14's hull armor isn't particularly thick in most places, but it's very well angled. Oddly enough, the most well sloped part of the T14's nose is also the weakest area, also containing the tank's machine gun port (its most glaring weakspot). The lower sides of the tank are covered in spaced armor, which protect it from HE and HEAT rounds. The turret and lower glacis are the most well armored places on the tank, which means the T14 can easily tank advantage of angling and hull down positions. Despite having all this armor, the T14 is fairly quick thanks to its powerful engine. The T14 may be able to take a beating, its armament has a hard time doing damage in return. The T14 is armed with the same 75mm M3 cannon that adorns the M3 Lee. Its alpha damage isn't particularly bad, but its biggest issues come in the form of its mediocre penetration and terrible accuracy. Though amply powerful for taking out smaller lights and mediums, the T14's gun struggles to penetrate other heavies. When faced with large, well armored opponents, the T14 often needs to use it's speed to flank and outmaneuver them. Unfortunately, while fast in a straight line, the T14 has very slow hull and turret traverse speeds, which complicates this. Because the T14s traverse speed is so marginal, a T14 with an inexperienced crew will struggle to maneuver. The Assault Tank T14 was a joint project between the United States and the United Kingdom. The T14 tank was supposed to be a design that was to be shared by both countries to give an infantry tank for British use. The pilot model was not produced by 1944, by which time the British Churchill I tank had been in service for two years and was greatly improved over its initial model. The T14 project never came to fruition. US efforts of working on a similarly well-armored tank with a higher speed for use other than as infantry support led to the T20 tank. 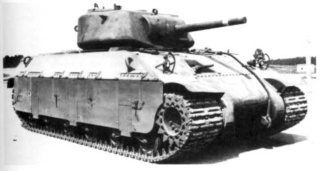 In 1941, the head of the United States Ordnance Department traveled to Britain to discuss designing a well-armed and armored combat vehicle, one that was stronger than the British Tank, Infantry, Mk IV (A22) "Churchill", then under production. The tank design would have a 6 pdr or a US 75 mm gun sharing many parts with the M4 Sherman, but with armor twice as thick as that of the M4 at 100 mm thick. The British initially ordered 8,500 in 1942. Testing of the pilot model, which was completed in 1944, showed the vehicle to be much too heavy for practical use. 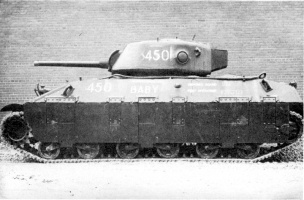 By this time, the British Army was already using the Churchill and further production of the T14 was halted. Only 2 were built; one tested in the US and the other sent to Britain. The example sent to Britain survives in the Bovington tank museum. a b Forty, George (1995). World War Two Tanks. Osprey. pp. 133–139. ISBN 1855325322. 이 문서는 2014년 8월 23일 (토) 01:34에 마지막으로 바뀌었습니다.